This month marks the 20th anniversary of the formation of the Coastal Concern Action Group (CCAG) so quite a milestone. 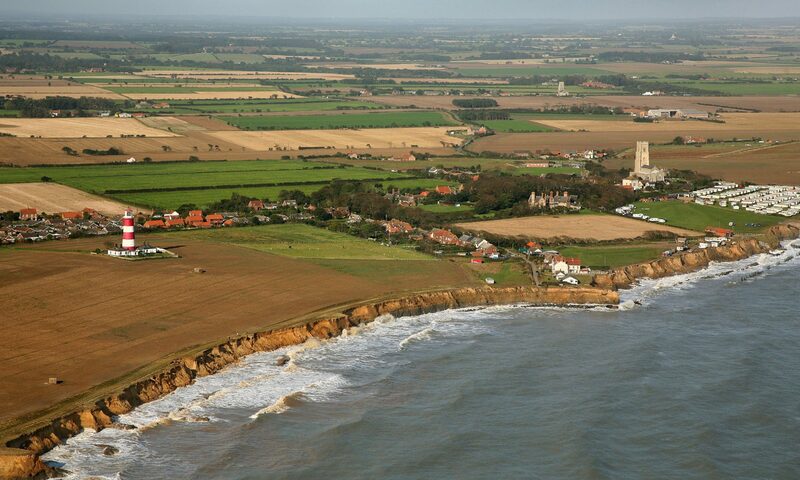 Before we go further let it be crystal clear, coastal erosion is not an exclusively Happisburgh problem. Whilst, obviously, it is a problem for our community we are just one part of a significant National and International coastal erosion problem affecting many other communities both at home and around the world. In March 1999 a meeting was called by a handful of residents to discuss with their community the extent and rate of erosion on our frontage and the seeming total lack of interest, action or support from Government. They were surprised when approximately 300 people attended. That meeting was the catalyst from which CCAG was formed. Just a week or so later a further meeting took place at Cliff House Tearooms of the twelve residents (of which I was one) who had agreed to commit to campaigning for action. It was at this gathering the name of the group was created deliberately omitting the name Happisburgh from it’s title as we knew we had to open up the argument and include other affected communities thus we did not wish to geographically confine our efforts. I was nominated Coordinator ( or Chair) of the group. My approach was centered around my determination to be absolutely true to the cause and not allow the group or any individual within it become bigger than the absolute and sole interest of Happisburgh. The next couple of years, for me at least, was mostly taken up with learning about physical processes on the littoral line and most importantly central government policy and approach, it was a steep learning curve. It became increasingly clear that government would not allow our defences (much of which was now dilapidated and beyond repair) to be replaced. This was reflected in their policy change for our frontage from Hold the line to No active intervention. Prior to this government had created further problems for us in the form of their quango English Nature (now Natural England) placing a designation along a significant proportion of Happisburgh frontage of a Site of Special Scientific Interest (SSSI). The terms of which legally prohibits the construction of defences. All this with absolutely no credence paid to either community adaptation or Social Justice. In other words central government was effectively saying we will not defend nor allow anyone else to do so, oh and by the way the community and individual residents have to bear the full cost and implications of that decision. To us and me this was a complete anathema for CCAG and Happisburgh it was let battle commence! In the interim we had developed a website thanks to one far sighted individual in our community who spent countless hours creating and running it for us. Thanks Jim it was way beyond my understanding! It proved to be a defining time for CCAG, our website went on to become the definitive site worldwide for all things coast management. The statistics for that site, for us at least, were the stuff of dreams we were getting worldwide recognition. By way of example, in June 2007 the site had 446,570 hits from 181 countries/territories around the world with 234,904 pages read. Over this period we were contacted by many coastal communities around the UK for advice and help. I travelled to the North East and addressed communities also the South West and along the South Coast as well as having many schools and university students for meetings here. I also went to Brussels to learn about EU policy and three times to the Hague for high level meetings with our Dutch friends along with our local MP with whom we had worked very closely. He became Chairman of the All Party Parliamentary Group (APPG) within the Palace of Westminster and I was invited to make a presentation to them which I did, subsequently to be invited to join the APPG as an external member. I met face to face with no less than six Government Ministers with three of them visiting Happisburgh all of this and more was rapidly making us an itch Government and Whitehall couldn’t scratch and culminated in CCAG (myself in particular) being invited to enjoin with senior Civil Servants from many departments at the then government think tank centre ( I think that’s what they called it) at Reading which I did and made more than one journey there over the next eighteen months or so. The outcome of all this was the announcement of the Pathfinder Project. Central Government made £11million available for the Pathfinder Project with all Maritime Authorities free to bid for money to undertake projects in their own area to act as a guide to what would be needed to put in place in future coastal policy, thus the title Pathfinder Project. Almost immediately North Norfolk District Council (NNDC) invited me to join with them in working up a bid which I did. We were successful in our bid and were awarded £3.2million to undertake various projects identified within our bid. The only constraint placed on the funding was that it must not be used for either the design of or placement of defences. Many small yet important projects were completed by NNDC right along their frontage but for us the most important of all was Happisburgh where we could without doubt point the way forward for central government to create policy in the future to include both adaptation and social justice. To do this nine properties considered to be at immediate risk of erosion were purchased and subsequently demolished with automatic planning right to replace them on the landward side of the village I am pleased to note that is happening now. Along with this funds were itemised to facilitate the move of the clifftop caravan park to the landward side of the village as the caravan park is probably the most significant factor in the ongoing economic well being of the community in that it would go a long way to ensuring the future of the local pub and the shop/post office. I am pleased to say the new caravan park is in place, due to open next month and looking very nice. Along with this Pathfinder has provided us with a new car park and public toilets with all proceeds going into our community via the Parish Council. Another valuable offshoot of our campaign was the way in which it drew the community together we must endeavour to maintain that togetherness and be proactive in fighting all divisive attitudes within what really is a great community. For CCAG after finding out there would be no way we could have defences we have achieved a very worthy alternative which allows our community and individuals within it to adapt to ever changing circumstances with some social justice. I am pleased to report with all these things in place Happisburgh is now feeling a little better about itself and as far as I can tell has a much brighter future.